The five major players spearheading $65 million plans for a fitness, aquatics and community complex in Elkhart have come together to make their commitments official. Leaders expect the center to attract high-level amateur swimming and diving championships and high school events from throughout the region. The stated investment includes a proposed $10 million endowment to pump $500,000 into operations and maintenance "year after year." That endowment, said fundraising team member Bob Deputy, will be supported through local philanthropic contributions and The Community Foundation of Elkhart County. The center's core group of supporters are the community foundation, Beacon Health System, Elkhart Community Schools, the statewide Regional Cities Initiative and the city of Elkhart. When complete, Beacon is slated to manage the 170,000 square-foot. The yet-to-be-named complex will include a 66-meter by 25-meter competition pool, diving well with 5-meter and 3-meter platforms and multiple 1-meter boards in the natatorium which will seat 1,200, a 25-yard fitness pool, therapeutic pool, wet classroom, gymnasium, community atrium and patio with access to walking trails. 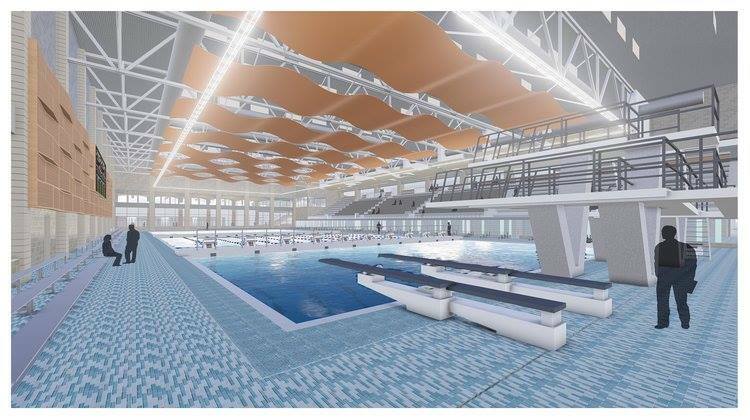 Plans call for the complex to be used by the local school swimming and diving programs, Elkhart United Aquatics, Beacon Health and Fitness and members of the community. Construction could begin this spring and it could open as early as 2019. The center is being called a "game changer" by Community Foundation President Pete McCown. Officials say just under $5 million is still needed. You can connect to more about the center by clicking here and through Facebook here.